The Trinity comes together in this week’s NCBD! This week’s New Comic Book Day Reviews brings us a trio of fantastic comics that you won’t want to miss. From DC we’ve got Trinity Annual #1, Marvel brings us some gamma glowing action in Hulk #6, and last but not least is Action Lab’s Spencer & Locke #2. Trinity Annual #1 is both a standalone story and part of a larger whole, providing an issue that is a great jumping on point and essential reading for longtime readers. 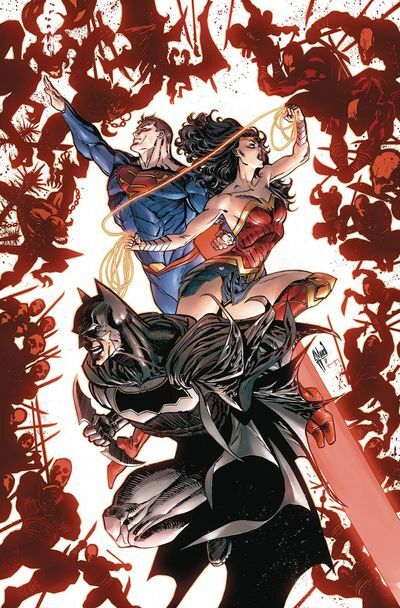 Trinity Annual #1 deals with the concept of trinities, exploring the effects that the trinity of Batman/Superman/Wonder Woman have on the DC Universe while also playing with the idea of a dark trinity. However, the book isn’t all theoretical concepts, as we get a fair share of action from guest star Etrigan the Demon. When Etrigan and Jason Blood separate, Etrigan goes on a warpath that takes the combined effort of the trinity to stop him. You won’t believe the sacrifice that our heroes make to stop this rampaging demon! CHECK OUT ALL OF OUR DC REBIRTH COMICS! Jennifer Walters has been fighting for a long time, both in the streets and in the court. However, one thing that always stays constant is her fear. 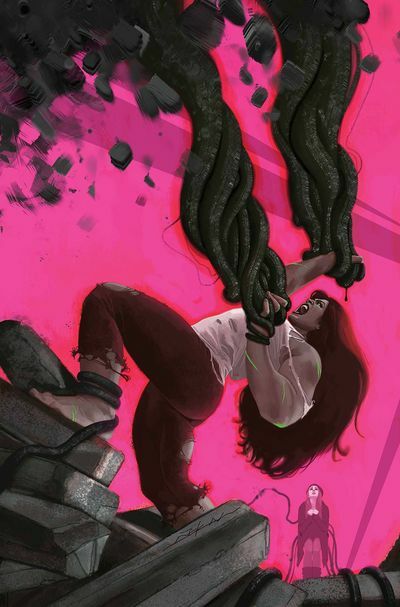 In Mariko Tamaki’s sixth issue of Hulk, Jen is fighting a manifestation of her own fear. It’s a fight that she must win if she’s ever going to save anyone again. Hulk #6 was a quick read. There is a lot going on here between the panels. The death of Bruce Banner in Civil War II has hit a lot of our heroes hard, and especially those who know the internal struggle he dealt with. Artist Nico Leon has this great way of making this series stand out. It looks almost one part manga influenced and one part Stjepan Sejic, especially when you add Matt Milla’s colors. By: David Pepose, Jorge Santiago, Jr.
Spencer & Locke #2 picks up right where the first book left off, with Detective Spencer still on the case of Sophie Jenkins’ murder. The comic still has the charm and style of newspaper strips like Calvin & Hobbes while retaining the sharp wit and expressive writing style that David Pepose does best. 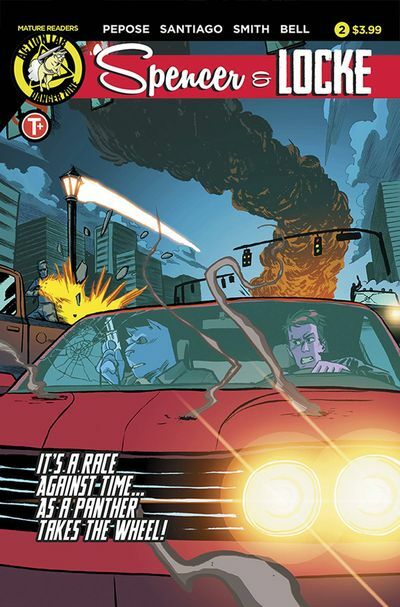 Issue #2 takes the action and turns it up to 11, featuring bar brawls, car chases, deadly shootouts, and so much more. If you are the type who wonders what Calvin is like as an adult, look no further than Detective Spencer. Even if you’re unfamiliar with Calvin & Hobbes, you’ll still love the unique style of Spencer & Locke. Since it’s a four issue miniseries, the action moves at a steady pace and never drags. LIKE SPENCER & LOCKE? THEN YOU’LL LOVE ACTION LAB’S OTHER COMICS! What happens when writer David Pepose riffs off a beloved comic featuring a boy and stuffed tiger and a gritty crime drama? Well, you get Spencer & Locke, a unique, quirky comic that’s sort of a Calvin & Hobbes meets Sin City. Pepose’s Spencer & Locke is a new limited four-book series from Action Lab – Danger Zone. In our interview Pepose discusses the genesis for his new comic, the comics that influenced him, and collaborating with the right people. TFAW: Let’s get this out of the way to start with: Why Calvin & Hobbes? David Pepose: Sometimes stories just strike you like a bolt of lightning. And when I thought of the question “what if Calvin & Hobbes grew up in Sin City,” I immediately knew Spencer & Locke was something I had to write. Because if I didn’t, somebody else definitely would have! When I first sat down to write a comic, I wanted to write something that used comics’ unique bag of storytelling tricks, something that spoke to comics fans first and foremost. There was this real attraction for remixing known properties to give them a more contemporary and adult sensibility, and it didn’t take long for me to think of Bill Watterson’s Calvin & Hobbes, the gold standard for comics and cartooning everywhere. I knew it would be subversive, maybe even blasphemous to do something like this with such a sacred comic book text. But as I started breaking down Spencer & Locke down as characters, I discovered not just some wonderful, three-dimensional voices behind all their bantering, but I realized there was a really powerful, human story underneath all the crazy action. We might not fill the massive shoes of our inspirations, but I like to think we add something to the mix. TFAW: How did you come up with the idea of putting these characters in such a disturbing world? Pepose: I feel like Spencer & Locke’s brand of pulpy noir was always a natural choice for me, just given the kinds of comics I loved growing up. Frank Miller’s Daredevil: The Man Without Fear was the first book that made me realize that actual writers and artists created comics, and it was Frank’s distinctive voice that made me devour everything else he had ever written. Noir as a genre allows for these moody settings and poetic inner monologues. But when you wind up splicing in Calvin & Hobbes, you almost have to lean into how disturbing this world can be, right? But I think while we do have some genuinely shocking moments in our book, it’s all in the service of a greater point. At its core, our story is about the traumas of childhood, how we get them and how we face them down. Everybody has scars, but are we defined by them? Can we overcome them? Or are we always destined to succumb to them? TFAW: Were you inspired by other Noir comics or films? Pepose: For sure–Memento is one of my favorite movies, and I see plenty of that in Spencer & Locke’s DNA. Chinatown is another favorite, as are L.A. Confidential and Brick. In terms of noir comics, as you can probably tell, I love Frank Miller’s work on Sin City, Daredevil and Batman. I’m also a tremendous fan of Ed Brubaker’s work on Criminal, which really helped inspire our book just as much as Watterson and Miller. Books like Southern Bastards, Blacksad, and Darwyn Cooke’s Parker books all served as this kind of creative compass to help us find our way. TFAW: Was there ever a part of you that, while writing, said to yourself, I must be crazy? Pepose: Ha, definitely! There’s an elasticity to the concept of Spencer & Locke that lets us really go wild with this book. Yes, we have the kind of awesome action tropes like fistfights and shootouts and car chases. But we also push the envelope even further later on, as we delve deeper into our heroes’ inner lives and psychology. The thing is, the original Calvin & Hobbes has such a robust iconography that’s recognizable by even the most casual of comics readers. And the sorts of twists and turns we put on them can sometimes be surprising or even horrifying. There are a few moments writing this book where I definitely said to myself, “wow, that is pretty messed up.” But the important thing to note about Spencer & Locke is that while we do get pretty dark as we examine the traumas of Locke’s past, it’s all in the service of a greater story. TFAW: Have you ever met Bill Watterson or Frank Miller? Pepose: No, and after this book comes out, I’ll probably be looking over my shoulder for the rest of my life. Bill, Frank– before you call the hitmen on us, just remember, we did this out of love! TFAW: What writers and artists have inspired you? Pepose: Having been on the other side of the interviewing table, I’ve learned a ton from writers like Dan Slott, Nick Spencer, Greg Pak, Rick Remender. And following writers like Grant Morrison, Geoff Johns, Devin Grayson. As far as artists, in no particular order, I love Jason Latour, Tradd Moore, David Lafuente, Roger Robinson, Scott McDaniel, Aco, Jerome Opeña. But honestly, my most inspirational artist is the one I’m working with. Watching Jorge tackle seedy back alleys, adorable flashbacks, harrowing action sequences, and homicidal psycho jungle cats got me fired up about this project from the beginning, and really pushed me to pull out all the stops. TFAW: How did you and Jorge come to team up on this project? Pepose: So much of Spencer & Locke’s development came incrementally. I wrote a script to see if I could do it, and when I liked that, I wrote the rest of the treatment, also to see if I could do it. When I liked that, I decided to try to find an artist to work with, just to see if I could do it. Of course, everybody has their own story of how to find a collaborator in comics, but the one that stood out to me was Justin Jordan and Tradd Moore for The Strange Talent of Luther Strode. Learning that Tradd was a graduate from the Savannah College of Art and Design, I wound up looking through several portfolios from SCAD alums. But when I found Jorge, I saw his website said he made comics with “stupid amounts of passion.” And I knew it was that passion that made him the perfect partner to work with for this project. Jorge brings such an energy and excitement to his pages, and such a great versatility. Every issue of Spencer & Locke has something awesome and cool that Jorge just knocks out of the park. Honestly, this book is so varied it could really be a portfolio piece for the both of us! TFAW: Do you think you’ll be teaming up together again soon? Pepose: There is nothing I want more than to do more projects with Jorge–particularly more Spencer & Locke! If readers pre-order our book and tell us they want more, I’ve got plenty more ideas of where these characters could go, and I’d love to see Jorge’s take on them! TFAW: Do you have anything down the pipeline we should be on the lookout for? Pepose: I’ve got a few projects in the pipeline at the moment. I’ve got a really fun crime/hostage story I’m developing, and I’ve got a sci-fi comic and a spy pitch that I’m also really excited about. I can’t talk too much detail at the moment, but readers and publishers alike, stay tuned! TFAW: The first issue presents a lot of questions. How quickly do you feel to need to have them answered? Or are you okay with leaving some questions unanswered altogether? Pepose: The thing that I like most about Spencer & Locke is that it’s not just about the detective story in the present. This is also about the story of how a boy and his imaginary panther became a pair of tough-as-nails hard-boiled cops. So for every step forward in the main plot, we’ll peel back another layer of Locke’s past, and really get into this guy’s head. But while we wanted to make sure readers feel satisfied with our plotting, we also tried to leave plenty of room for readers to have their own interpretation on things. After all, Spencer & Locke is a story about imagination, perspective, and the mind. I think its very easy to be a passive participant when reading a comic, but I feel like by trusting the reader and giving them the opportunity fill in the blanks, it lets fans feel even more invested in these characters. TFAW: Who’s on your bucket list to work with? Pepose: You know, I’ve never really thought about that before! I don’t know if I necessarily have a “bucket list” of artists to work with, per se, because I really just the idea of teaming up with talent that is as young and hungry as I am. But I do admire plenty of talented artists around the industry–Chris Samnee, Declan Shalvey, David Lafuente, Doc Shaner, Becky Cloonan, Tradd Moore. Honestly, if Spencer & Locke has taught me anything, it’s the importance of finding the right people to work on the right project. For me, once you have the idea, the team will follow. TFAW: What comics are you reading now? Pepose: I’m reading more books than I know what to do with! Mark Waid’s Champions, Dennis Hopeless on All-New X-Men and Spider-Woman, All-Star Batman, 4 Kids Walk Into a Bank over at Black Mask, Detective Comics, Southern Bastards and Animosity, just for starters. And then there are a handful of older trades I’m digging through again for old times’ sake, like Transmetropolitan, Hawkeye, and Judd Winick’s Exiles. Peanut butter and chocolate. Chips and salsa. Rum and Coke. Some things are just meant to go together. But how about Calvin & Hobbes combined with Sin City? That’s the premise of Spencer & Locke, a new limited four-book series from Action Lab – Danger Zone. At first, the idea sounds silly, maybe even offensive. Calvin is a beloved comic strip featuring a boy and his stuffed tiger that gently taught life lessons. Sin City was a gritty crime drama chock full of murder, con men and prostitutes. Here the thing though–Spencer & Locke works. Like a charm. When we first meet the pair in the new series Spencer & Locke #1, they are sneaking out of the house to play, a la the comic strip characters they are based upon. But the similarities are quickly wiped away as young Spencer gets a right cross from his dear ol’ mom. Writer David Pepose keeps the story moving through the use of flashbacks, taking our heroes–and maybe the story’s villains as well–back to happier times. As the time shifts, so does Jorge Santiago’s artwork, moving from simple childlike imagery to a gritty urban landscape. Pepose sets up enough drama and compelling characters to keep us asking questions and coming back for more–blue panther or no. Spencer & Locke #1, Action Lab – Danger Zone, Release date April 26, 2017, Written by David Pepose, Art by Jorge Santiago, Colors by Jasen Smith, Letters by Colin Bell; $3.99.